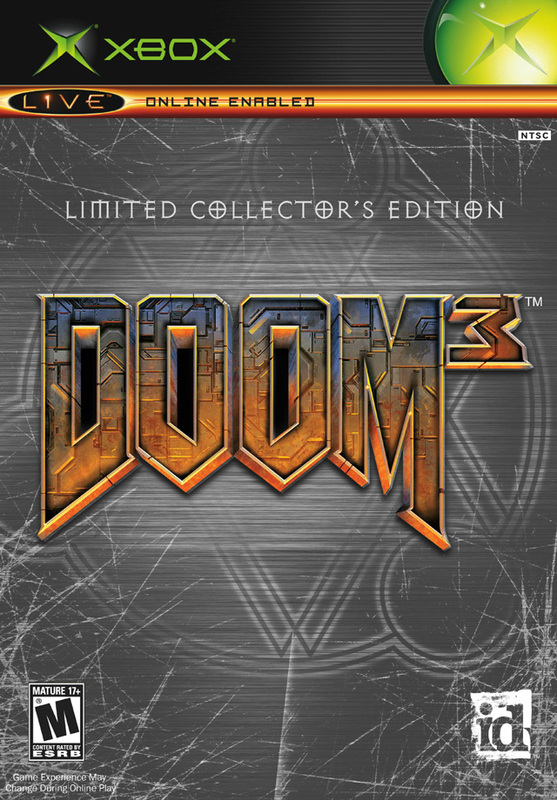 The Doom 3 logo sticks out on the limited collector's edition. Always willing to spend a few extra bucks when it comes to video games, I picked up the limited collector’s edition of Doom 3 when I purchased it way back when. The first thing you notice about it is its case. Instead of the standard plastic Xbox case, the limited collector’s edition comes in a metal tin. However, unlike the two previous collector’s editions I’ve reviewed, the Doom 3 limited collector’s edition is not a SteelBook package. The package is common among other collector’s editions, but I prefer the SteelBooks; this one seems cheaper. The Doom 3 logo on the case is raised and that’s cool, but the thing I like most about its overall appearance is the slipcover. The case contains the logo in front of a pentagram and the case is all gray. The slipcover, at least on the front is clear except for the Doom 3 logo; it’s in color and I liked the stark contrast between the gray background and the orange logo. What about the actual contents? Well the best part of the package is the inclusions of Ultimate Doom and Doom II: Hell on Earth. The inclusion of these two makes this the version of Doom 3 to buy hands down. While Doom3 doesn’t feature split-screen co-op or multiplayer, these two do, so that’s also nice. There are also some videos with the limited collector’s edition. By far the best is the episode of Icons (an old G4 TV show) covering Doom. It’s about twenty minutes long and it’s a great reference to learn more about Doom and id Software. There are a handful of developer interviews with key people at id Software and these are cool. Lastly there’s concept art and that’s okay, except for the inability to pause the concept art slideshow. All in all I thought Doom 3 was an excellent game and after searching the internet it appears that the limited collector’s edition goes for a few more dollars than the standard edition, well worth it in my opinion. The previous versions of Doom and Doom II are worth the extra money alone, but the videos are for the most part great, the concept art is good, and the case is cooler than the standard edition. If you’re purchasing the Xbox version of Doom 3, the limited collector’s edition is the way to go. See that guy on the box art, that’s a hell knight and he’s one tough demon. 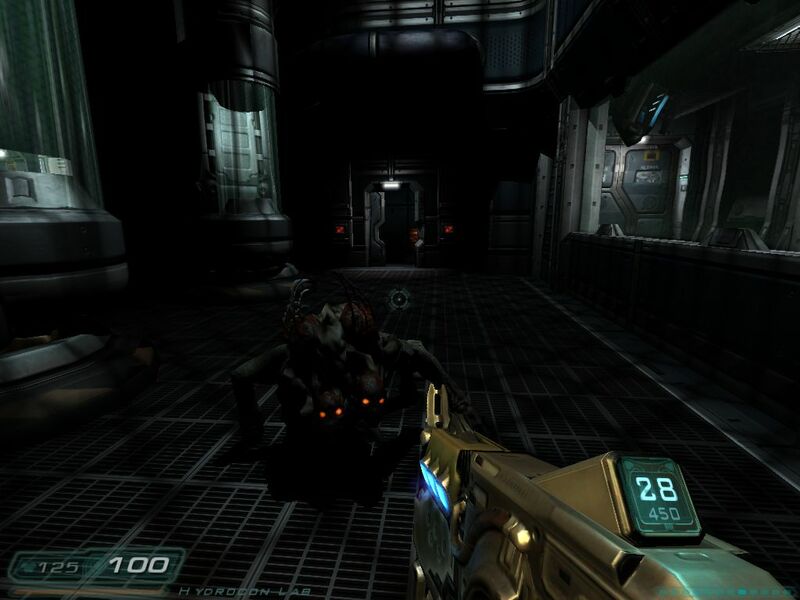 Released about a decade after the previous installment, Doom 3 reset the series but maintained its place as a forerunner for things to come in terms of technical specs. But it wasn’t just a technical powerhouse in its day; it has solid gameplay with many neat features. 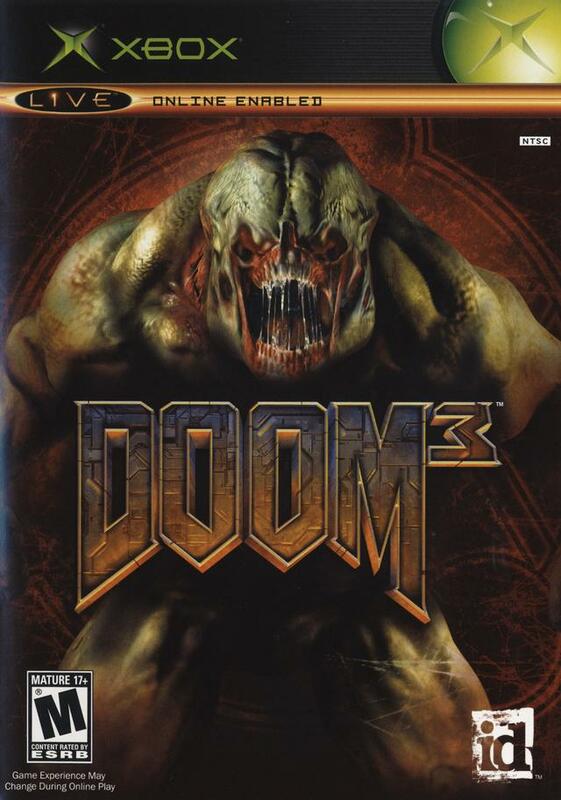 Doom 3 was originally developed by id Software while the Xbox version was ported by Vicarious Visions. It was published by Activision on April 3, 2005, eight months after the initial PC release. Flipping through the manual I also noticed that Raven Software received a credit for additional Xbox development and that Splash Damage was credited for additional multiplayer design; many people worked on this game for sure. As you can see from these screenshots, the UAC complex is a very dark place. Doom 3 is set on Mars in 2145. The Union Aerospace Corporation has a research facility there and they have been conducting many experiments, and a lot of things have been going wrong. Enter Councilor Elliot Swann. He has been sent in to conduct a review of the UAC, primarily the facility’s head scientist, Dr. Malcolm Betruger. The nameless marine that I played as arrived on Mars with Swann and his bodyguard, Jack Campbell, a beefed up marine. Pretty much as soon as we landed all hell broke loose, literally, and from then on I was always trying to catch up to Swann and Campbell. As I’m sure you can imagine, Betruger has gone crazy and is behind the strange occurrences happening. He had been working on teleportation technology and in the process opened a portal to hell. After sending marines in to bring back demons to research, Betruger went in himself and lost it. With the UAC facility running wild with demons and zombies, it was up to Swann, Campbell, and me to get to Betruger and close off said portal. This was easier said than done. I began the game separated from Swann and Campbell and spent the rest of the game playing catch up. I made my way through hallways upon hallways of linear stages attempting to reunite with them. 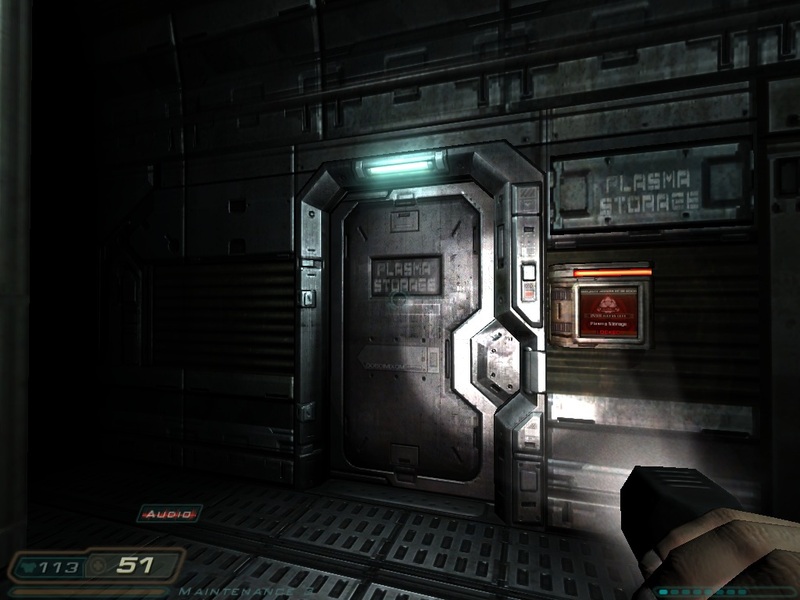 There weren’t any open environments or differing paths to take in Doom 3. I simply followed the path and whenever I reached a locked door or something that hindered my progression, I found the key card or whatever it was I needed and kept on. The UAC facility wasn’t empty though. I’d run into the random straggler who had somehow survived and they’d usually provide me with important information. But the most common residents of the complex were demons. There were tons of demons throughout the complex, often time hiding in what has since been termed “monster closets”. The designs for these creatures are absolutely grotesque. The more common Imp was humanoid but had a dirty looking exterior and ten eyes. Worse of all, he could leap at me or throw fireballs. These were all over the place and not that tough, I eventually just shotgun rushed them. There were many more demons however and plenty of them took a lot to take down. I have to mention the final boss and just mention that it was epic and a fairly tough fight. There were plenty of weapons to choose from and all the staples are accounted for: the pistol, shotgun, machine gun, etc. But the weapons I really loved (although I really loved the shotgun) were the super powerful weapons. A hallmark of the series, the BFG 9000 is present and it’s devastating. It fires a green orb that destroys pretty much everything in the same room. The chainsaw was interesting and fantastic to use against the weaker enemies. Another noteworthy weapon was the Soul Cube. A remnant from a lost civilization, it was super powerful and when used, restored my health completely. But I had to get five kills before I could use it. I do have a complaint about the weapons. I didn’t like the way they felt; it didn’t feel like I was bludgeoning a zombie with my flashlight when I hit them; perhaps this had to do with the otherwise exceptional sound design. I’ve heard many complaints about the flashlight not being attached to a weapon but I was fine with it. While I mentioned earlier that game is linear, and it is, I still got a minor sense of exploration. As I searched every nook and cranny with my flashlight, I was usually rewarded with extra ammunition or health supplies, very nice. Usually I was also rewarded with a few extra demons to fight too. One moment that sticks out in my mind: I was walking through a server room and I spotted some armor shards in a completely black corner, as I picked them up an Imp appeared in front of me and spooked me. I felt like I was getting rewarded for having a keen eye, while also getting more out of the game in the way of enemies. Another exploration aspect of Doom 3 was the PDAs. This UAC complex was recently inhabited by many people, what’s left of them, besides zombies, are their belongings, namely their PDAs. Contained on their PDAs are emails and voice recordings filling me in on what happened before I arrived. I was always stoked to find a new PDA because I wanted to see the info it contained. The flashlight played a major role as I made my way through the complex. As I stated before, I used it to explore every dingy corner of the complex. But usually it was necessary just to make it to the next door. 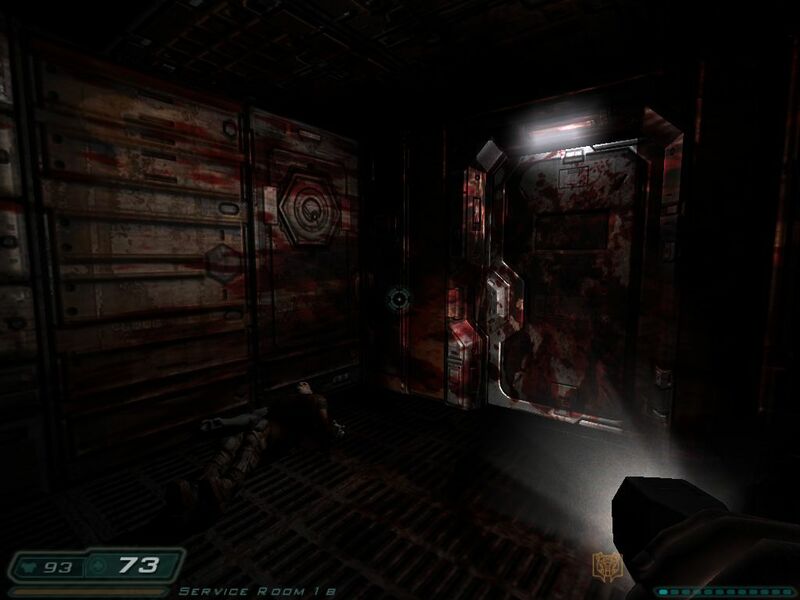 If Doom 3 is remembered for any technical aspect I hope it’s its lighting effects. The lighting system in the game did a great job of creating areas that were completely dark, even in the same hallway or room that had some light in it. When demons spawned from pentagrams, the lights would dim and turn a bloody red. What I found fascinating was how well the flashlight cut through the darkness and how much of a necessity it was. There were a few instances where I had to dredge through pitch black rooms, and it was a spooky experience. Especially towards the end, the UAC complex was a very bloody place. Doom 3 kept me entertained. I was interested watching the plot unfold, and even though its linearity was more apparent than it is in other games, I still enjoyed making progress. The game is very dark, definitely a horror story, but outside of its many jump scares, I didn’t find it too scary. Although playing with the right mindset and the lights out made it a tense experience. I enjoyed the gameplay, but it’s a unique FPS in that the single player is the main draw, which is okay with me. I loved the lighting system and the flashlight (even if it wasn’t attached to a weapon) and special mention should be given to the atmospheric sound design, very creepy. I’ve been to hell and back and I believe Doom 3 is a worthy game in an iconic series.